Aged between 21 and 39, the ten men come from all walks of life from an insurance manager to IT specialist, technician to TV engineer, coffee shop worker to a paintball shop manager and an outdoor activity instructor. They will now join one of Shropshire’s three wholetime fire stations at Telford Central, Wellington or Shrewsbury prepared for a future of saving lives, fire fighting, carrying out rescues from cars, water and collapsed buildings as well as teaching people how to prevent fires, or whatever comes their way in their new careers. The new recruits were “the best of the best” to win selection for the course from hundreds of applicants, said Deputy Chief Fire Officer Andy Johnson, who praised instructors for getting the group “up to speed” on all the skills needed for a modern firefighter. There would be a lot of studying and practical tests over the next two years before they became “competent” firefighters and sometimes they would have “a bad day at the office” which had a whole different meaning as a firefighter, he said. 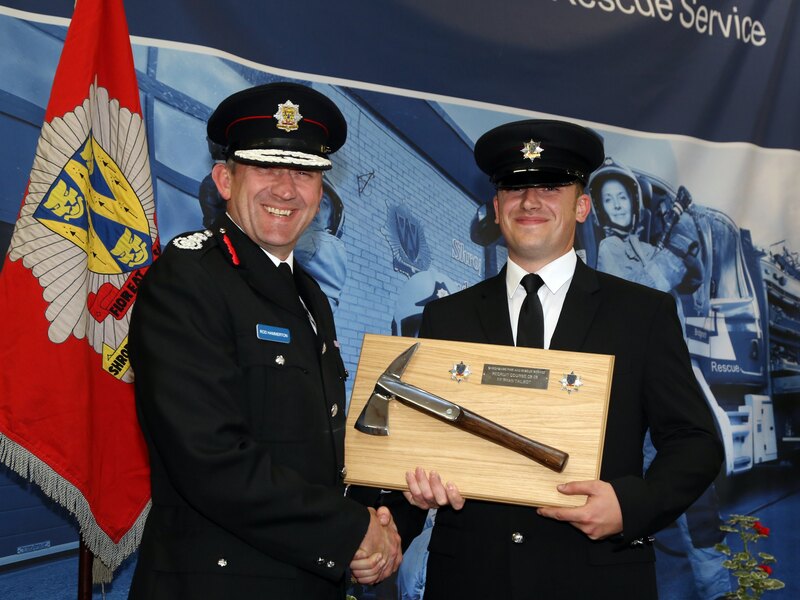 The top student award went to former soldier Ryan Talbot, who runs his own outdoor pursuits business, who received the Silver Axe trophy at a ceremony held at the brigade’s Training and Development Centre at Telford Central fire station in Stafford Park. 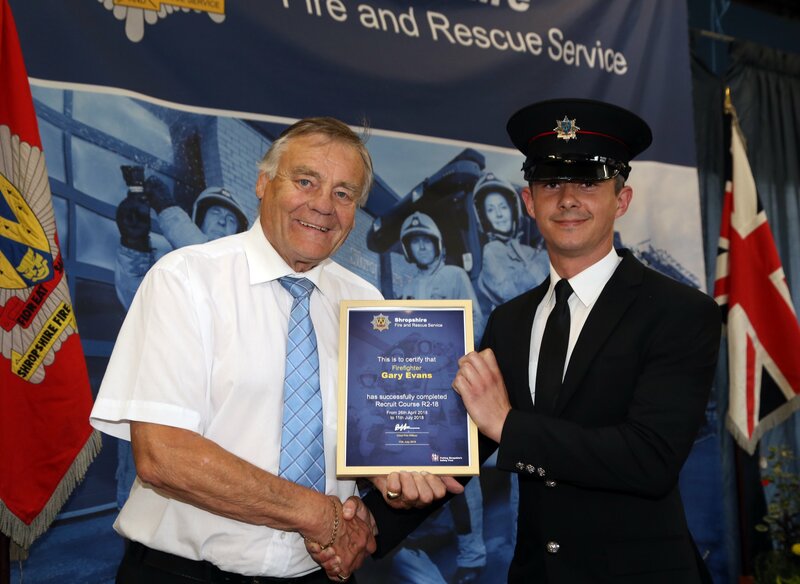 The instructors’ award went to Gary Evans (28), an ex Army Royal Engineer from Telford, who worked at a local garden centre before being selected to join the fire service. The new recruits were trained in core skills to work fire appliance pumps and ladders, use breathing apparatus, attend road traffic collisions, carry out complicated rope rescues, and were also trained in trauma care. They spent eight weeks at the Telford firefighter training centre and one week at a specialist training centre at a Lincoln RAF site where realistic training scenarios include derailed train carriages, a collapsed three storey building, underground bunkers, shops and supermarkets. They also deal with real car fires. New recruit Leo Silva (24), from Shrewsbury, who moved to the UK from Portugal as a nine-year-old, said firefighter training had been “a brilliant experience.” He will be based at Telford Central fire station. “I’m grateful to have been given this opportunity,” said Leo, who worked in a coffee shop and volunteered to support people with brain injuries before joining the fire service. Another recruit, Mark Bishton (21), from Albrighton, is the third generation of his family to become a firefighter. Fire authority chairman, Councillor Eric Carter, presented them with their certificates.